I was inspired by this bright and cheery Hot Pink Chevron Middy Bitty Bag. 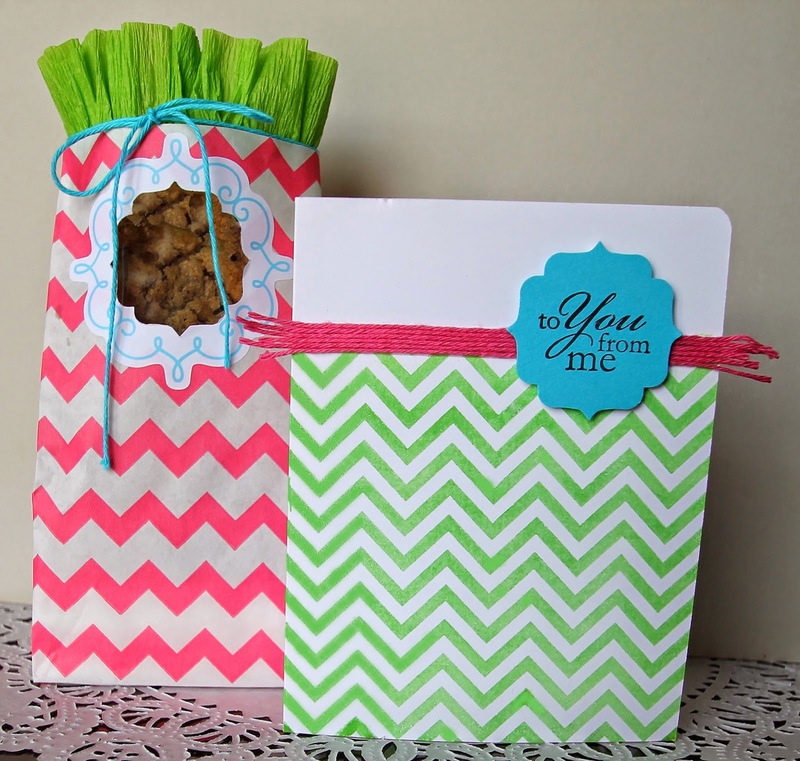 I loved combining the hot pink, turquoise, and lime green on the card and treat bag. Such hot summer colors! I used a punch to cut out the center of the Aqua Scrolly Square Label so you could see the chocolate chips cookies in the bag. A strip of acetate (clear cardstock) keeps the goodies inside the bag. Blue Solid Divine Twine ties the bag shut and adds a little more of that pop of color. Deep Pink Solid Divine Twine is used on the coordinating card. 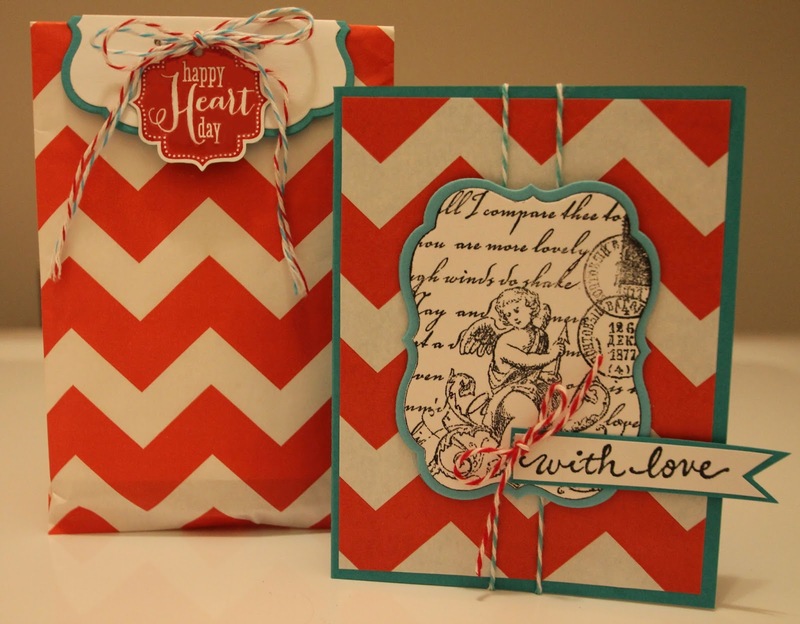 I made this fun little card and coordinating bag for my dear hubby. Today not only will the 15th be Father's Day, but it's also our 19 year wedding anniversary! I really have no idea where the time has gone. It's been a blink of the eye! For the card I tied Air Mail Divine Twine, Navy Solid Divine Twine, and Red Solid Divine Twine on the Small Tag that's stamped Happy Father's Day. 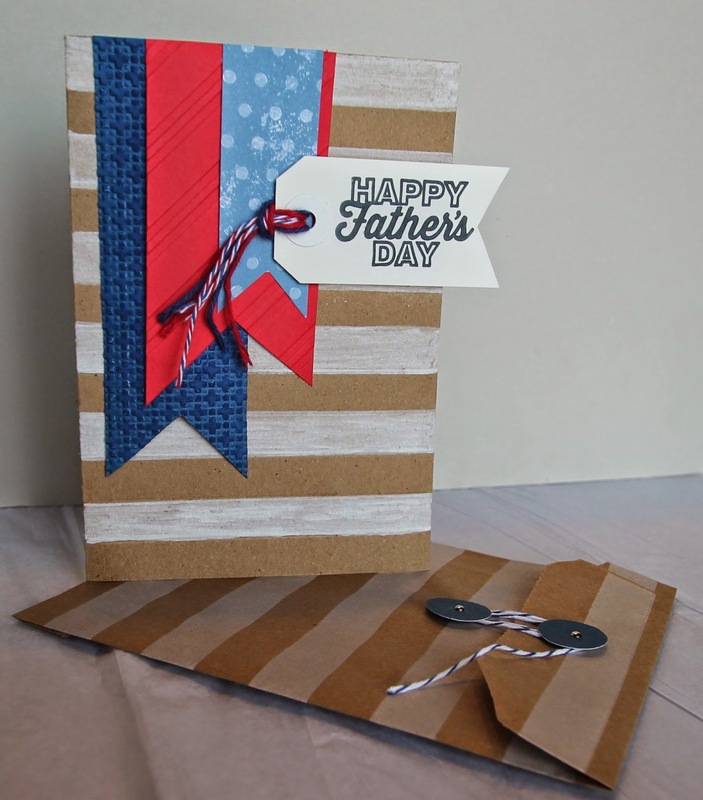 A white chalk marker worked beautifully to create the stripes on the kraft card base. I used Blueberry Divine Twine on the White Horizontal Striped Middy Bitty Bag to create the tie closure. I find it easy to use a couple tiny brads and circle cardstock pieces along with a bit of twine to create the tie closure. It's a simple way to create interest with the bitty bags. Plus it gives you a way to reuse the bag for another card or treats. If you haven't already done so, I certainly encourage you to check out all the fantastic things at Whisker Graphics. 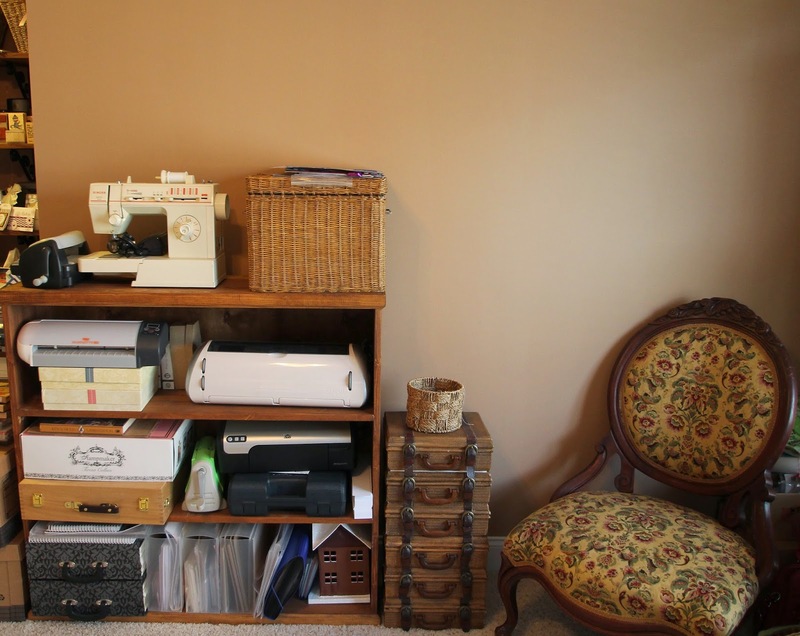 When you first walk into my craft room you immediately see in front of you a large window flanked by bookshelves and a daybed. I sewed the cover and made the matching pillows for the daybed. 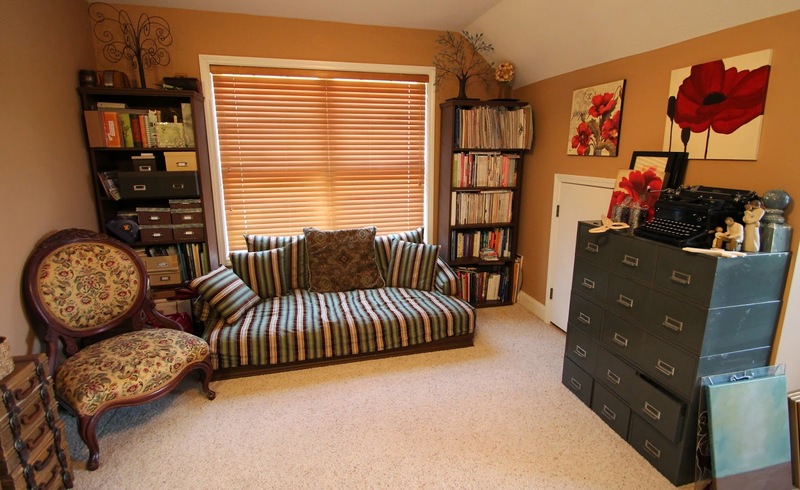 The book shelves hold books of course lol! Plus a ton of past issues of Close To My Heart and Stampin' Up! catalogs, magazines, photo albums, dies, embossing folders, etc. When I bought the chair, I was originally wanting to spray paint it black and add some type of Halloween inspired fabric. Something that would scream Edgar Allen Poe. I found the vintage metal filing cabinets for a steal at $35. 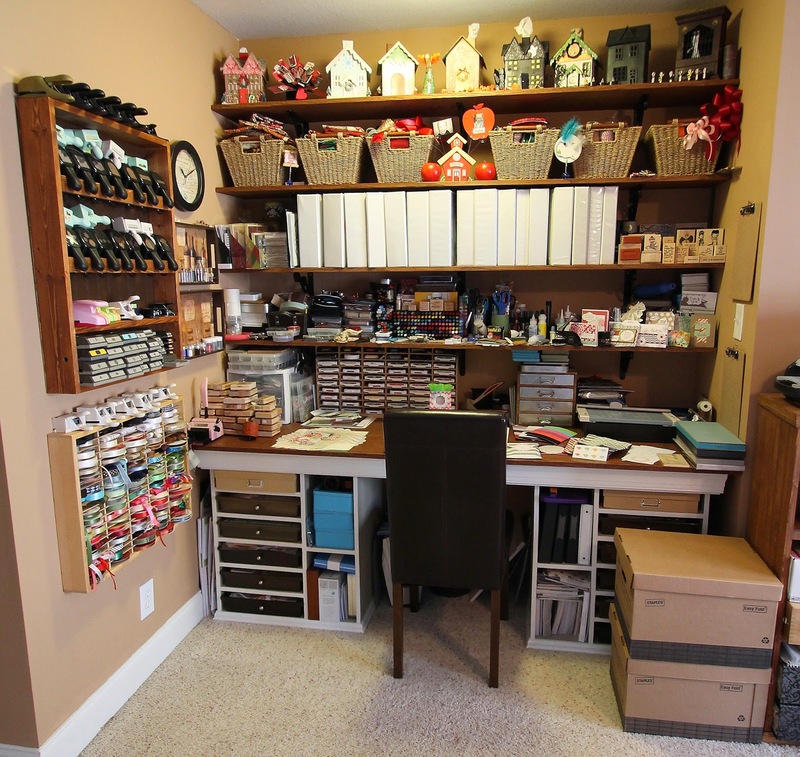 The filing cabinets hold things like my Tapeswell collection, paint brushes and paint, glitter glue and adhesive, reinkers for all my ink pads, polymer clay, alterable items like chipboard pennant banners and sketch books, etc. 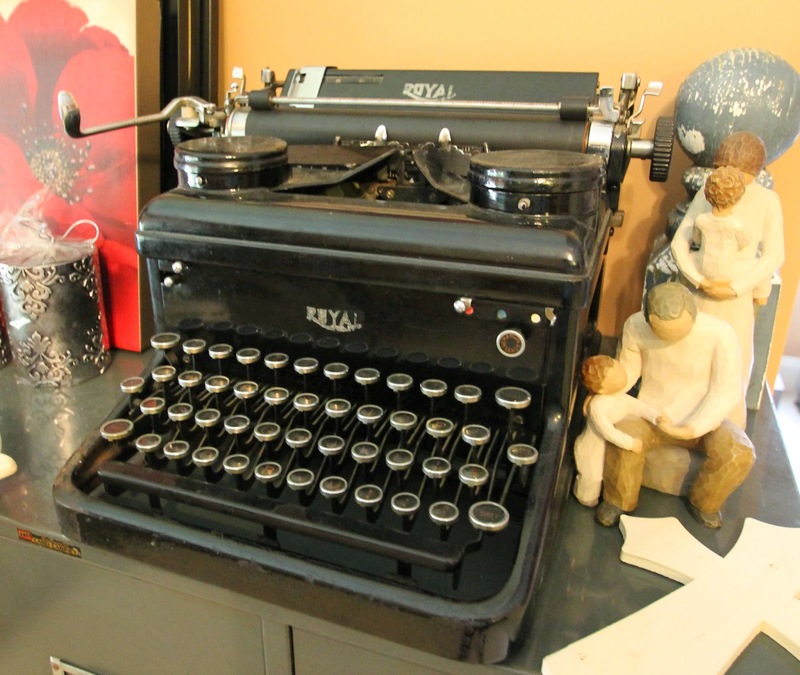 I totally lucked out on finding this antique Royal Typewriter for $60. When you look to the left you can barely see the beautiful desk Chad Built me. I've been thinking about posting pictures of my office for a long time. I kept thinking I'd clean it all up to make it look orderly and perfect. Heck, I'm always working on some sort of a project. Then I get inspired to make something else, and leave a huge mess on my desk. It certainly helps having a desk that's 6 feet long. Even if it's covered up all the time lol! The very top shelf holds all my chipboard houses that hold boxes of Kleenex. The baskets below them hold fabrics, large spools of ribbon and twine. The white binders hold the majority of my stamps and thin metal dies. A few of my favorites I left as the original wood mounts and display to the right. The left hand side has some pre-made card kits. The bottom shelf is a true hodgepodge of stuff! 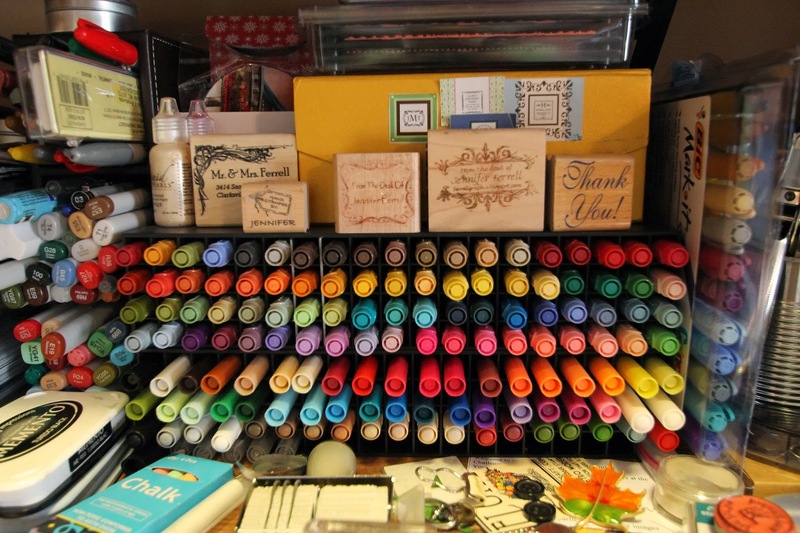 I have all sorts of markers, embellishments, adhesives, scissors, and other crafty nonsense things. Sitting directly on my desk to the left is a plastic box full of embellishments, then a bunch of my inks pads, a couple of tools, A wood & metal box full of mini ink pads, then a tray I try to contain my work in progress. I'm not very successful at that. I bought a couple of Marker Towers from my Close To My Heart Rep. I bought all the Stampin' Up! markers and several from Close To My Heart. Then I discovered Copics and intend to buy many, many more! I just had to have all the colors of Sharpies too. Chad built this tower for me to hold all my stamp pads. 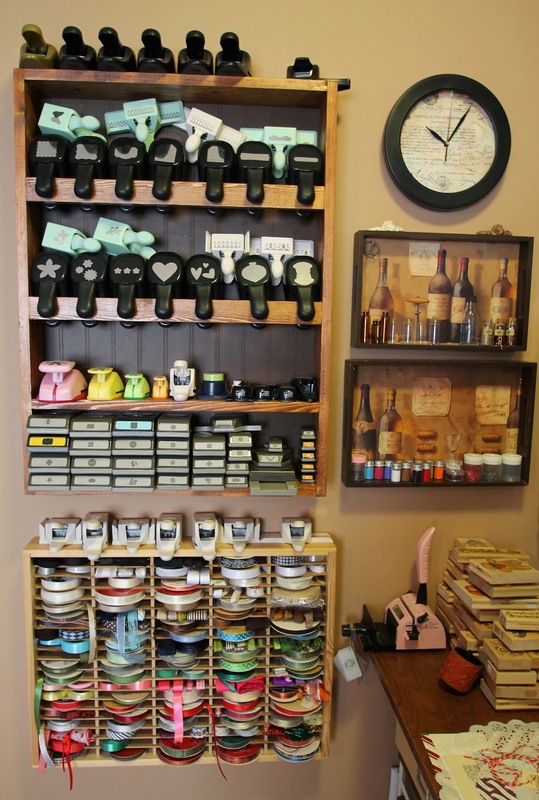 I bought all my favorite colors of classic ink pads from Close To My Heart and Stampin' Up! SU! discontinued the craft ink and I've found I like it better. It may take a little longer to dry, but it's easily used in heat embossed images, and coats a stamp better to give a clearer crisp impression every time. I think in colors. Shoot, I wake up in the morning and think what color do I feel like today. 8 1/2 x 11 cardstock. 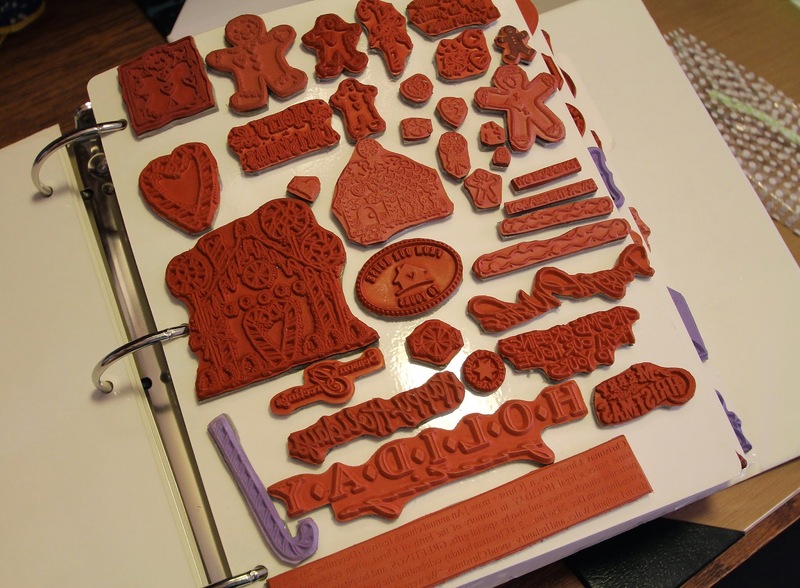 Several years ago I decided to pull apart all my wood mounted stamps. I used EZMount Cling Foam and Stamp Storage Panels from Crafters Companion. I organized the stamps in my binder system by theme. All my Christmas stamps are together, Halloween, stars, hearts, nature, etc. I know several people are probably thinking OMG! You pulled apart the sets, Yup I sure did. When I want a star for a project, I can simply flip to that page and pick the perfect star. It makes it easier to find the perfect sentiment too! I can quickly pick the perfect "thank you". I store my thin metal dies in the white binders too using EZMagnetic Storage panels. 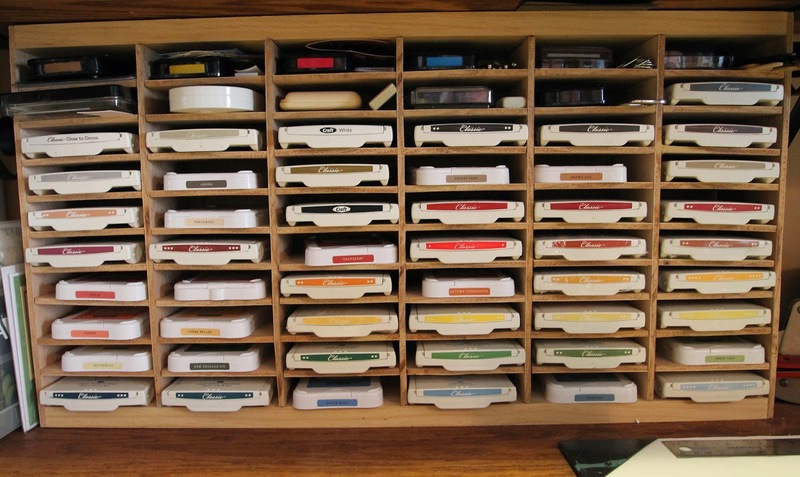 The wall to the left of my desk has all sorts of ribbon stored in an old cassette tape holder. I saw the idea on Pinterest and had to have one. It took a long time to find one, and cost a pretty penny! Chad built me the punch organizer for me too. I'm loving the flat designed punches. So much easier to store and see. I have a couple of wine theme serving trays I hung on the wall to hold little bottles of things like glitter, flocking, brads, eyelets, etc. To the right of my desk is a shelf Chad built for me. Yes, the man is pretty handy and talented! The top holds my Epic 6, sewing machine, and a basket full of patterned papers. Below that is my Silhouette and Cricut machine. I like both, but I love having punches to the left of my desk. I can simply reach for them. No Machine to plug in and try to get the size right the first time on whatever shape I'm needing. The next shelf holds my Teresa Collins Stamp Maker, Cuttlebug, Label Maker, and printer. I hate buying ink, so the printer rarely gets pulled out. 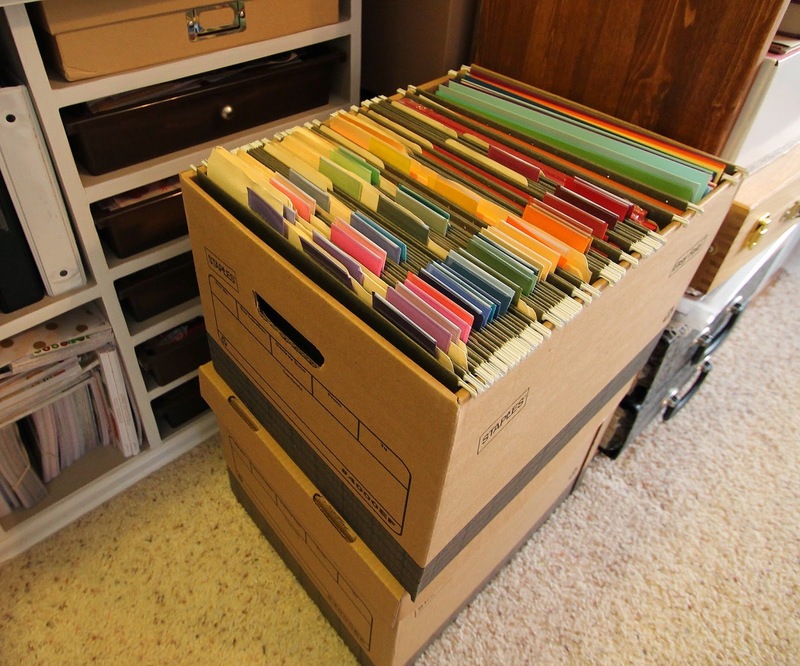 The bottom shelf has a couple of accordion files that hold paper scraps organized by color of course lol! A few plastic boxes holding more patterned papers, and a Gingerbread chipboard house in progress. The "suitcase" boxes hold all sorts of beads, jewelry findings, and tools to make jewelry. I can't decide on how to arrange art on the wall. Eventually I'll get something hung. 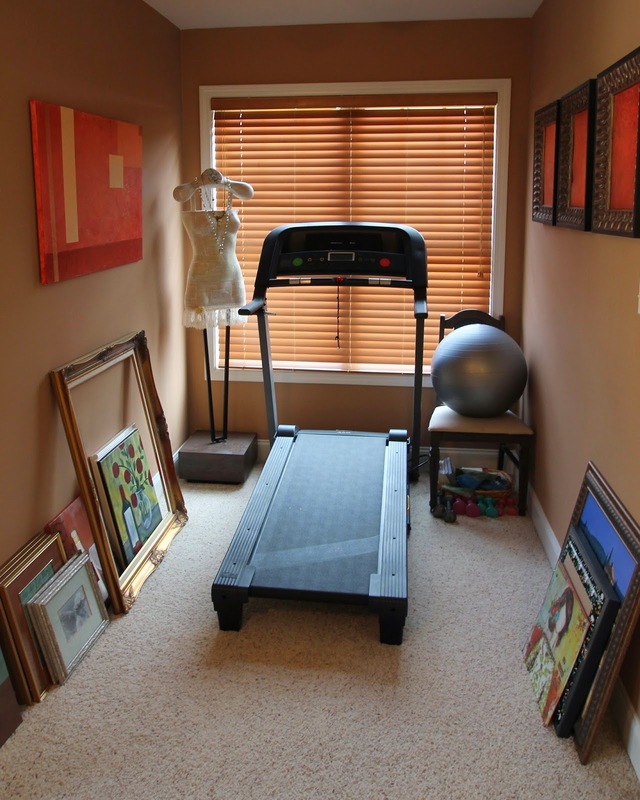 When you walk in my office to the right you can see an area for a dormer window that holds my treadmill. Several of my paintings, stained glass pieces, and other art work that I need to hang line the walls on the floor. The mannequin has yet to inspire me to actually exercise lol! 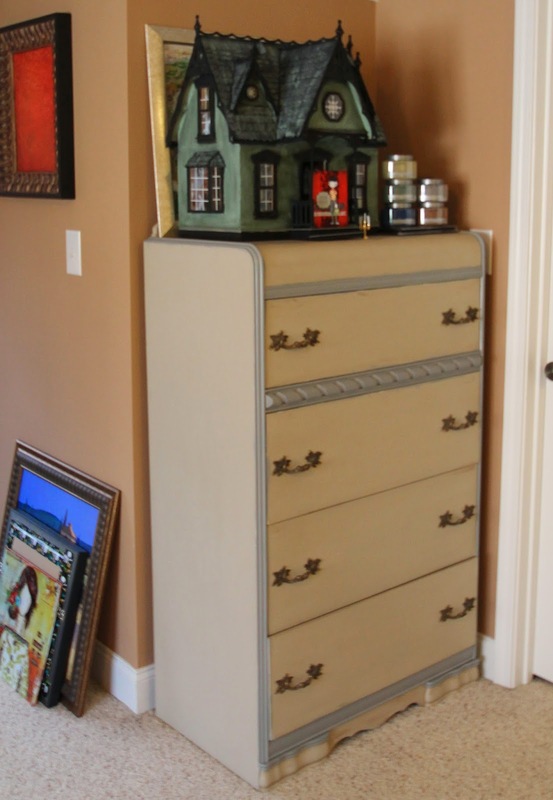 My waterfall dresser holds all sorts of stuff! 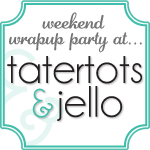 A ton of envelopes, more stamps from Close To My Heart and Stampin' Up! (in the newer DVD cases), tissue paper, wrapping paper, etc. The door next to the dresser goes to the closet that holds all my stained glass equipment and supplies. I keep the glass in the closet to prevent Parker from getting into it and cutting himself. My Haunted House is still a work in progress. It's done for the most part. I'd like to find the perfect "wallpaper" for the inside and get some furniture for my house. 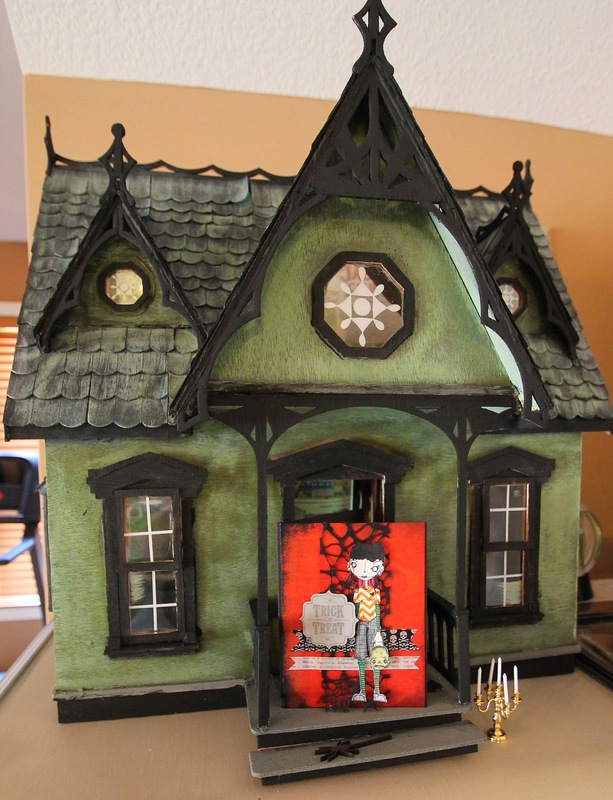 I gotta tell you that I won't ever build a dollhouse from scratch again. OMG it took a week straight before I could even begin to paint! I still want to take some pottery classes. And I have no desire to knit or crochet. Chad will be glad to know he won't need to build me something to hold yarn lol! Recently Chad decided to add a new water feature to the back yard. 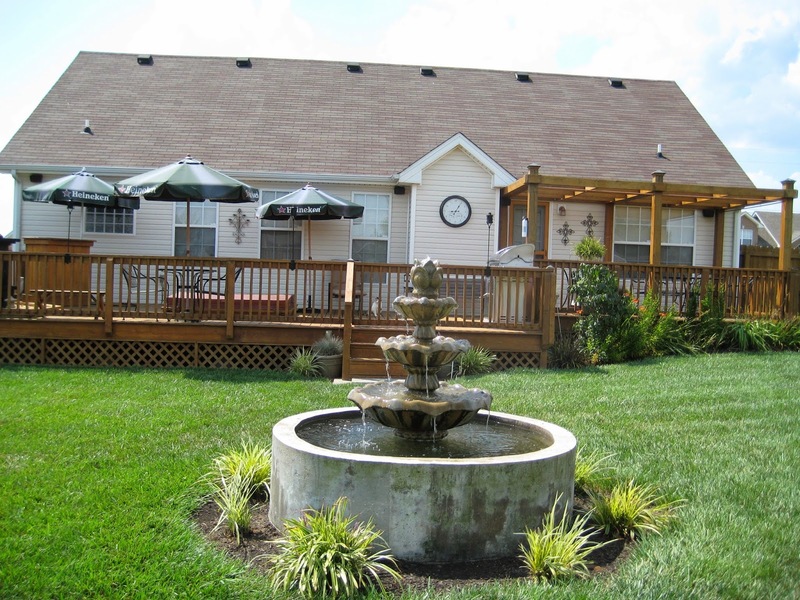 We really missed hearing the trickling of water from the fountain at our last house. Although I loved the way he made it with the three tiers, it was a bit formal for the craftsman feel of our new home. The fountain was my very first Mother's Day present. So it was only fitting he built me a new water feature for Mother's Day. Parker was such a good helper. 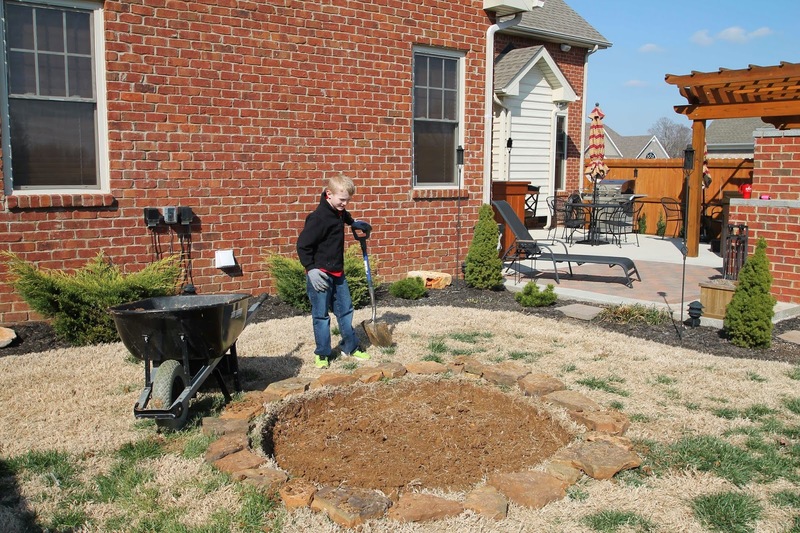 He helped place rocks for the size and shape. And he helped dig up all the dirt. 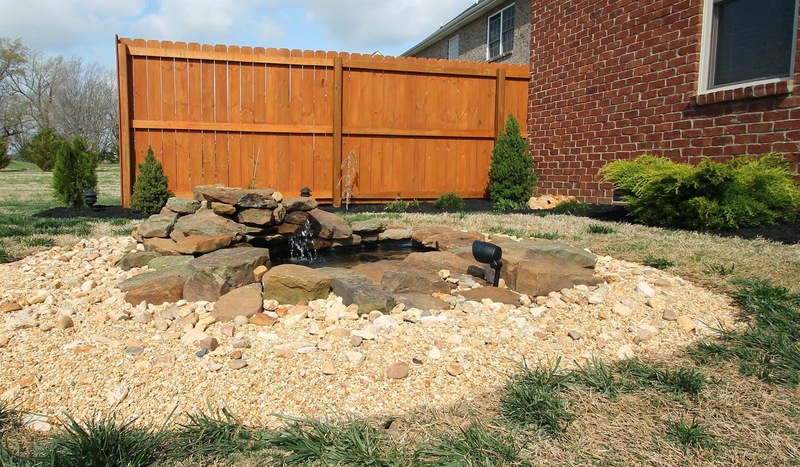 I need to decide on some plants to add around the pond. It's come along quite nicely. Now if we could only get rid of the Bermuda grass! Chad added some lights throughout all the landscaping. It adds such a warm ambiance at night. 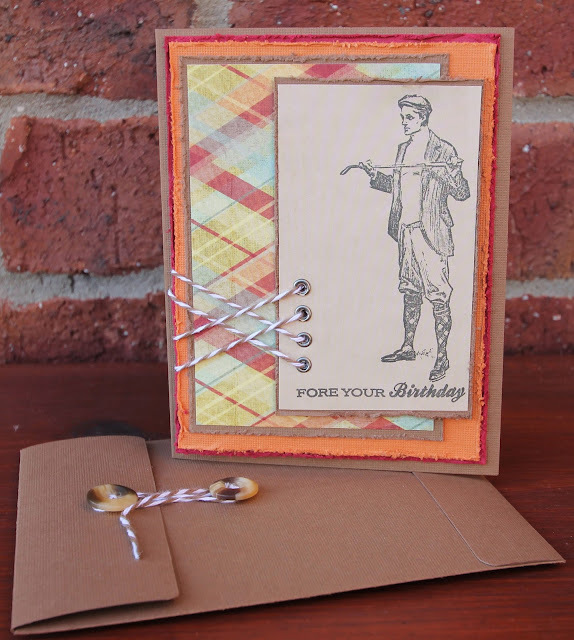 I made this fun little card and matching envelope for Chad's birthday. 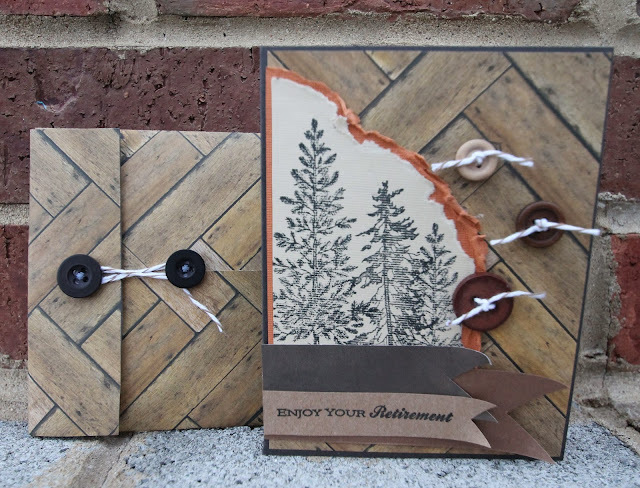 The tie closure envelope was made with a sheet of cardstock, twine, and buttons. I think it turned out pretty cool and makes a neat presentation for a hand delivered card. Next time I will wait to seal the bottom of the envelope before stitching the buttons into place. I love the way it turned out and know he'll love it! 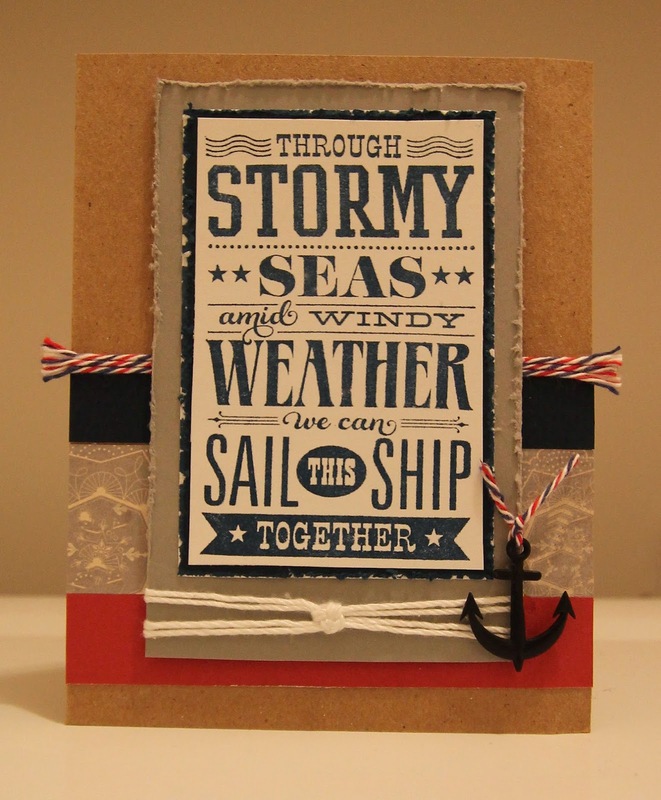 The sentiment came from a stamp set called On The Links by Papertrey Ink. The plaid paper came from Pink Paislee, Old School I believe was the collection name. I found the vintage golfer stamp on Ebay from Flonzcraft. They are based in New Zealand so it takes a little while to get stamps from them in the mail. I've bought several other golfer images as well as custom made stamps from them. And have been very pleased with all my purchases. Goodness Valentine's Day will be here before we know it! Chad and I have a friend that is retiring from the Army so I wanted to make him a card. Since I will be hand delivering his card, I decided to make a tie enclosure envelope to match. I think it makes it feel even more special, important if you will. I'm sure he will appreciate it. I just can't seen to get enough wood grain paper, stamps, and embossing folders. I love it all! I found this herringbone paper at Hobby Lobby. I used a couple of tree stamps, the one in the middle came from Gina K Designs and the other from Stampin' Up! The sentiment came from a set called On The Links by Papertrey Ink. I was flipping through all my stamps looking for some inspiration to make a card when I came across this one. I bought it from Close To My Heart a long time ago. It was about time I inked it up. The fun red, white, and blue twine is called Air Mail Divine Twine from Whisker Graphics. I'll be giving this to Chad for our anniversary in June. It will be our 19 year anniversary. Crazy! It's hard to believe we've been together for so long. I don't feel like I'm old enough to even say that! Yesterday I found this turned wood lamp at Goodwill for only $3.99. I thought about painting it, but the wood was in such beautiful condition. I decided to simply remove the old lamp component and top it with a pillar candle. I can only imagine how much the lamp had originally cost. It stands at 22" tall. 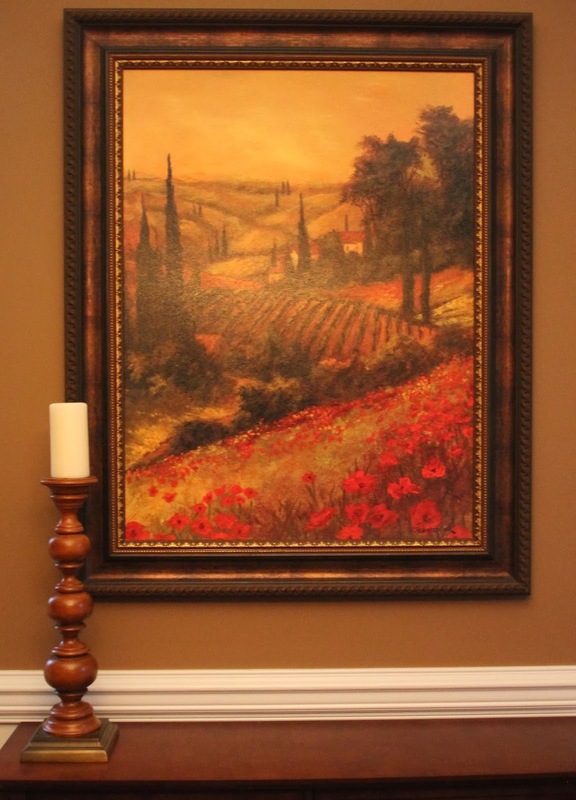 If I found this at somewhere like Pier One or Pottery Barn it would have easily cost $100. I think it's a pretty amazing Goodwill Store find! How do you organize your pots and pans? I asked Chad to get me something to organize my kitchen. I couldn't stand having to lift up, and pull out all my pans to get to the one on the bottom. 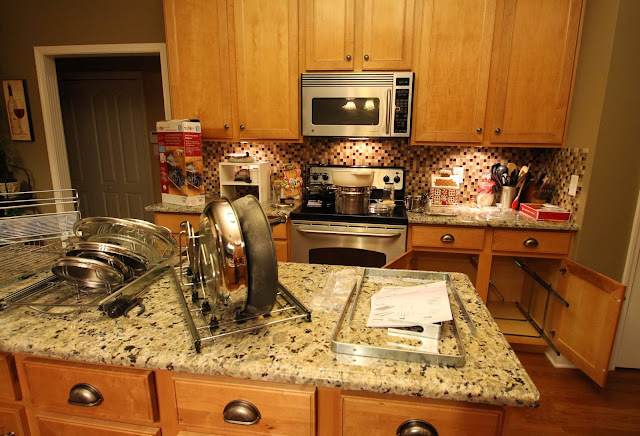 It seems like I always want to pull out my big 12" pan that is on the very bottom. What a hassle having them stacked on top of each other. 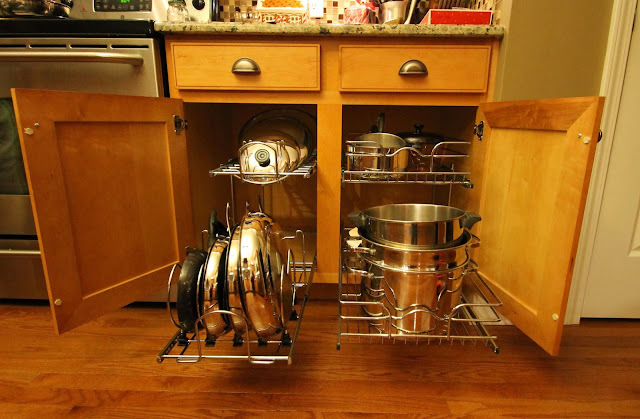 We bought two different styles of Rev-A-Shelf 2-tier pull out cabinet baskets. 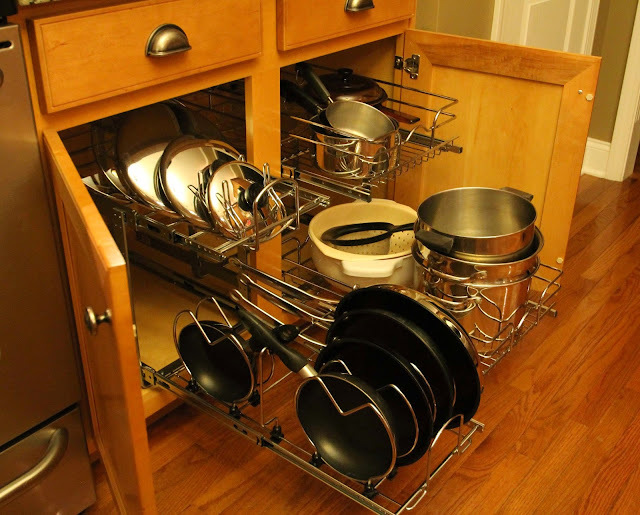 One side neatly organizes all my pans and lids. The other side stores pots and colanders. The new system pulls out smoothly and everything is easy to access. I am thrilled this project is completed. It only took about an hour from start to finish. 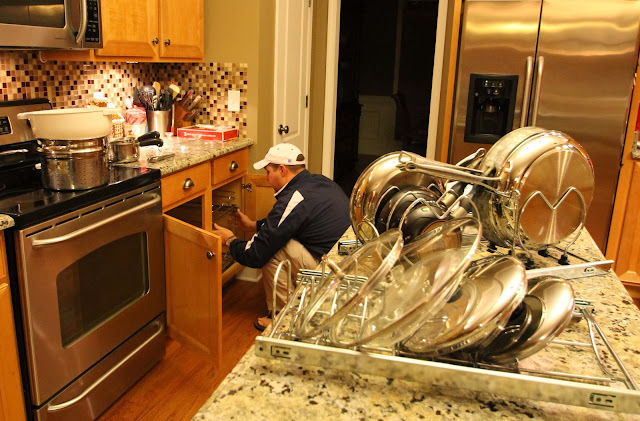 Including pulling everything out of the cabinet, cutting out the existing shelf, assembling the new storage system, and putting everything in it's new home. It was under $150 and worth every penny!